As all residents know, water surrounds the state of Florida and appears in intermittent patches all throughout the land with ponds, lakes, rivers, streams, and springs. While many of us love the water that is such an essential and beautiful part of our lives, there are times during which we desire distance from the water for the purpose of the health, safety, and sustainability of our homes and communities. Therefore, in order to preserve the original separation of land and sea, seawalls have become a common feature of our Florida coastlines and inland properties. Seawalls are the walls or embankments erected to prevent the ocean or another body of water from encroaching upon or eroding an area of land. Also known as bulkheads or retaining walls, seawalls are often made of materials such as reinforced concrete, steel, vinyl, aluminum, wood, fiberglass composite, gabions, boulders, or sandbags. As surges and tidal fluctuations are some of the inevitable challenges associated with owning waterfront property, seawalls hold great significance to the livelihoods of business owners and the peace of mind of homeowners who rely on these structures to defend them from water damage. 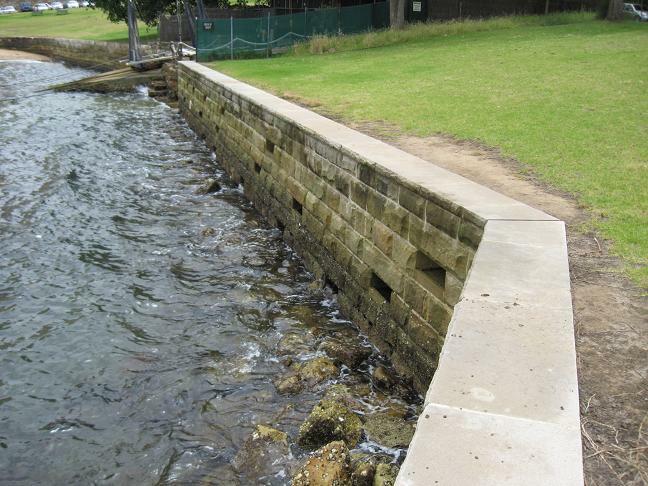 Therefore, it is very important that seawalls maintain their protective functions. However, seawalls themselves are not completely immune to the deterioration that occurs under the constant battering of the waves, winds, and other elements. The pressure of these natural forces often results in unsightly cracks, pitted surfaces, soil washing away, a bowing or bulging middle, gaping at the bottom or top, growing distance between the seawall and the deck, and even the total failure of the seawall. When these signs of struggle and breakdown appear, you can be sure that your seawall is in need of repair. The cost of repairs will only rise the longer you wait to address the problem, so do not delay when it comes to fixing your seawall. With the help of Solid Foundations, seawall repairs are much more affordable and effortless than you may realize, so seek our seawall erosion repair services quickly in order to save what is left of your seawall. If the cracks, loss of soil, sinking, or rotation you see happening to your seawall are not attended within a specific time frame, adding a new section to the wall or replacing the wall completely will soon be your only possible solutions. So, to receive the fastest and most effective remedy to troubles with your seawall, Solid Foundations’ seawall erosion repair services are here for you. Seawall erosion repair with Solid Foundations is very economically feasible thanks to our Targeted Grout Injection that can fully restore your distressed or failed seawall. Targeted Grout Injection involves inserting a polyurethane resin through a 3/8” ID port to plug leaks and penetrate underground voids. Targeted Grout Injection from Solid Foundations is ideal for seawall repair because of the specific characteristics of the type of resins we use. Typically, conditions behind seawalls dictate working with wet soils and often working below the water level. 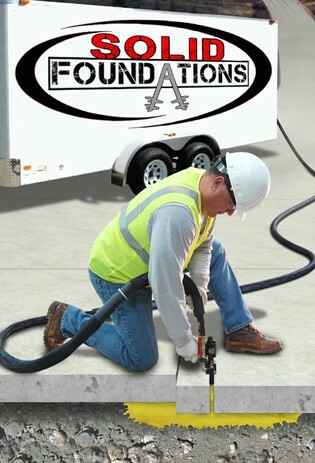 Therefore, for wet soils or below water level environments, Solid Foundations offers leak repair resins referred to as hydrophobic grout. These resins are typically used to suffuse holes and stabilize soils due to their low viscosity, high expansion rate, and ability to cure under wet conditions without diluting. When injected into wet, loose soils, our hydrophobic grout repels water by expanding and filling voids. Hydrophobic material is virtually unaffected by fluctuation in the moisture content and retains its strength, size, and impermeability under almost all soil conditions. As these extremely thin, hydrophobic resins that we use for our Targeted Grout Injection react with moisture when pushed into the soil to form a rock-hard, waterproof mass, this superior repair system eliminates the need for any digging or excavation. The hydrophobic polyurethane resin we inject into the soil, called Prime Flex 910, is harmless to the environment yet still exceptionally effective as it solidifies loose soils and sands to stop underground water flows and deactivate seawall leaks. Prime Flex 910 is ANCI/NSF certified for use in potable water tanks, so the safety of the water is never jeopardized with Solid Foundations’ seawall repair products. Using Prime Flex 910 in our Targeted Grout Injection supplies property owners with the advantage of seawall repairs that are watertight; set in a controllable time; pumped as a single component; able to strengthen the soil; and meet Florida DOT specifications for chemical grout injection of soil. The experts at Solid Foundations are highly proficient in the Targeted Grout System and can provide you with seawall erosion repairs in a timely and considerate manner. Whether organic soils, poor compaction, improper footing embedment, swelling clays, erosion, or runoff has caused your seawall issues, Solid Foundations can assist you today, so please contact our team today to get your seawall back on solid ground.